The idea that you may have to defeat your opponent by a death of a thousand cuts is a recurring theme in activism. You should use your strategic planning stage to get a really broad ranging grasp of all of the tactics that may be available to use in your campaign. You can still select the ones you think are most useful or appropriate and concentrate on these, but there’s no harm in having a few extra tactics up your sleeve. Particularly when dealing with governmental or corporate institutional players. Government and corporate institutions are usually quite resilient to public pressure and sometimes quite experienced at trying to neutralise its effects. They may be ready for a predictable campaign in the media, for protest meetings and letters to the editor, but if you can suddenly confound them with a variety of surprise tactics you may be able to wrong-foot them. I find it useful to employ a lot of metaphors to describe this strategic approach, once you know what your chosen strategies and tactics for achieving change will be, you may find it useful to also deploy a number of other nuisance or distracting tactics. I call this ‘lighting spot fires under your opponent”. For government institutions these spot fires may take the form of formal complaint processes, inundating powerholders with request for meetings, sending large numbers of submissions or formal requests for information, activating public participation processes, investigating and complaining about conflicts of interest and any other tactics that will radically increase their workload, or put them under added scrutiny, while you concentrate on your main strategic attack. For corporate players, the same spot fires can work but will often take different forms. Going in the backdoor and utilising minority shareholder rights, initiating complaints to corporate investigative bodies, checking out potential conflicts of interest and making formal complaints can also be useful ways to harangue and distract them. 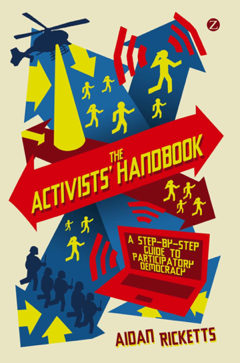 (See chapter Seven: Corporate Activism) I call these tactics spot fires because on their own they may not be all that useful in achieving your main goal, but as a strategic tool for exhausting and hamstringing your opponent they can be very effective. The extension of the metaphor is that your opponent will be so busy trying to put out the spot fires you are starting, that they will be distracted from the main game. I am not suggesting any dishonesty either, these tactics are genuine tactics for seeking greater accountability, and should be based on bona fide concerns, it’s just that you may otherwise have discarded them as unlikely to yield positive results, but when you realise that simply by distracting your opponent that you are gaining an advantage, they take on a whole new value. The message here, is to be very resourceful in taking stock of what tactics are available to you, and do not be too quick to discard possible options. Corporate players can sometimes be pushed to make a commercial decision to withdraw rather than face the escalating costs of fighting an unpredictable and damaging public interest battle on multiple fronts; politicians similarly may end up realising that the fight is becoming too damaging for them. A golden rule for activists is to remember is that power holders are the ones who have everything to lose. This understanding helps turn your relative powerlessness into a form of power in itself. Usually the worst that can happen to you is that you lose your fight, which was going to happen anyway if you didn’t fight. Tactics are like the fireworks of your campaign, they can be fun, attract a lot of attention and if you are lucky they may make a sizeable bang.